How can you Gamble without Losing Money? Wouldn’t it be great if you could enjoy the thrills of gambling without risking your hard-earned cash along the way? Wouldn’t it be awesome if, instead of succumbing to the house advantage with nearly every trip to the casino, you could consistently win money while playing games you enjoy? Of course it would, but that’s not really how the casino industry works. In casinos around the world, there’s a thing known as the house edge. This edge is the advantage that the casino has on each bet you make. With slots, the edge can be anywhere from two to 15 percent. With roulette, the edge is 5.26 percent if the wheel has two zeroes. 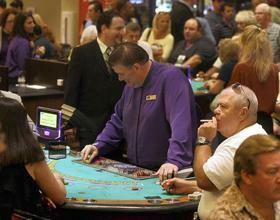 In baccarat, the edge on a banker bet is 1.06 percent. In blackjack, some games may have an edge as small as 0.28 percent. Even when the edge is small, it’s there. That’s why winning at the casino is so difficult. Not only do you have to be lucky enough to overcome fair odds, you’ll need to beat the house edge on a regular basis in order to consistently win. So, how can you do this? Without breaking any laws, it’s practically impossible. The reason is simple: the games aren’t fair. Let’s take a closer look. When it comes to pure 50/50 bets, few things can compare to a simple coin flip. Let’s say you bet $1 that the coin lands on heads. Your odds of winning are exactly the same as your odds of losing. Over time, these odds will even out and, eventually, you’re statistically certain to end up back where you started. Keep in mind that long-term results don’t eliminate the possibility of short-term anomalies. There may be 10 flips in a row that land on tails. That’s the nature of 50/50 bets. However, with enough dedication and ample playing power, coming out even on a coin flip is entirely possible. Casino games are unfair in the sense that they don’t offer players an equal chance of winning and losing. That doesn’t mean that winning is impossible, and it doesn’t imply that rules aren’t strictly followed. In the long-term, players are statistically unlikely to win at casino games because of the ever-present house edge. The key to gambling without losing money is eliminating this advantage. Since that’s not possible, players are forced to do the next best thing: minimize the house advantage. This is why games like baccarat and blackjack are your best bet for gambling without losing money. It’s all about the statistics. Your best chance of winning big is to do so quickly, as time will inevitably return the statistical imbalance imposed on casino games. If your goal is $1,000 and you’ve got $900, you’ve got a better chance of reaching your goal by betting the full $100 and hoping for the best. Playing it safe and betting $5 per round, you’ll need to overcome the unfair odds 20 times or more. With bold play, you’ll just need to overcome the odds a single time. 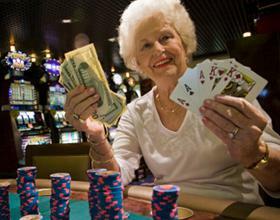 Gambling without losing money is statistically unlikely. Challenge the statistics by avoiding long stretches of play. Big bets can mean big winnings, and we all know that fortune favors the bold.